Falkland is shaped by two successful bloodlines: his sire Wanderer is an "allround" producer who passes on to his progeny jumping ability as well as talent for dressage. 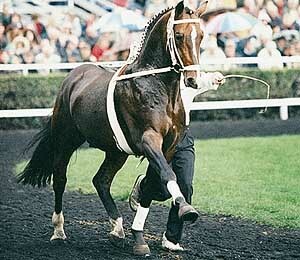 The sire of Falkland's dam Pik König is renowned for producing excellent dressage horses. Falkland himself is also a versatile producer. He passes on to his offspring jumping ability as well as his very energetic movements. His progeny also stands out for excellent rideability. In 1999 his son Frenchman came second at the stallion performance test in Adelsheidsdorf.